Lots of couples have Valentine’s Day traditions and we’re no different. But instead of fighting crowds for a table at a romantic restaurant, our tradition is to stay in, enjoy the time together, and put a yummy steak on the grill. If you’ve been a follower of this blog for long, you’ll already know that we truly enjoy beef around here. Maybe it’s because my daddy always had cows on the farm and that meant beef in our freezer when I was growing up. I just know it’s always my protein of choice. We’ve tried many different ways of cooking steaks over the years and have settled on a dry rub mixture that we usually use. But recently I wanted to try something a little different, so I came up with this recipe for a Citrus Marinated Ribeye with lots of Mediterranean flavors. The marinade has good olive oil, fresh lemon juice, orange juice, rosemary, and garlic. It’s truly delicious! The only caution – don’t leave your steaks in the marinade too long or the citrus juice will start to cook them. Not good. Just mix up your marinade ingredients in a large resealable bag, add the steaks, and let them sit for about 1 1/2 hours. No more. Grill the steaks until they’re cooked the way you like them. While you’re cooking the steaks, heat the marinade over medium heat, reduce to a simmer and keep warm. Spoon a little of the warm marinade over the finished steaks while they’re resting. You’re gonna really love this one. I just know it! 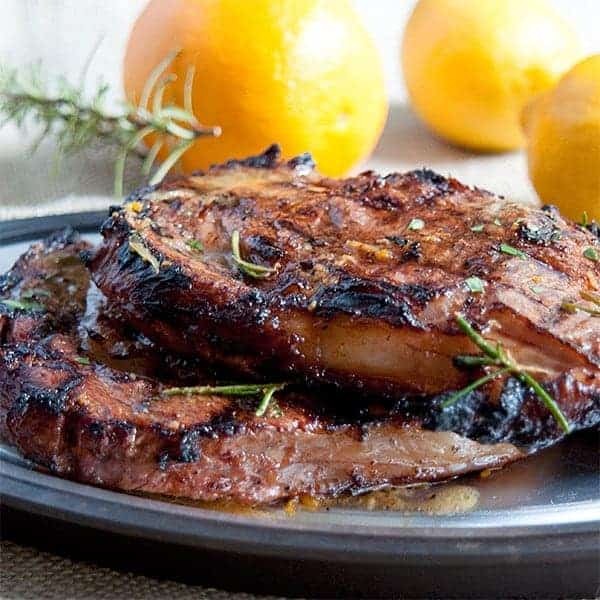 Ribeye steaks marinated in olive oil, orange, lemon, rosemary, and garlic. What a fantastically fresh marinade! Love it. Hope you’re on the mend Lana! It looks mouthwatering. It’s a great marinade, I will love to try it. I love a good ribeye. This marinade sounds fantastic! Aw, that’s so tough! I hope you feel better soon! In the meantime, this ribeye looks absolutely incredible! UGh… I know EXACTLY What you mean Lana… being out of the kitchen for a long time is so hard!! 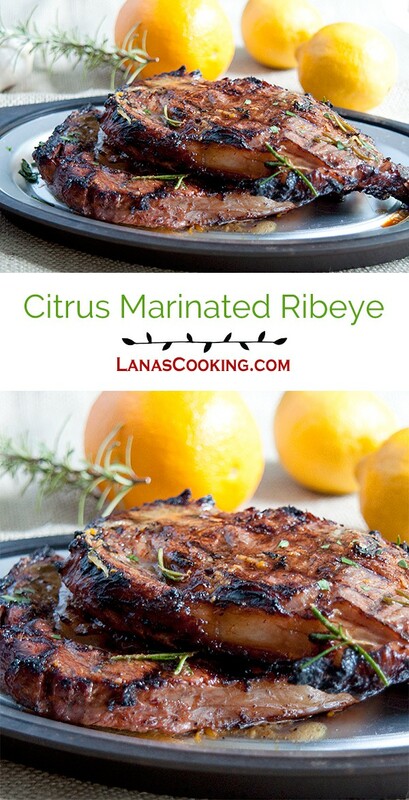 So happy you got to at least makes these steaks and they sound perfect – I adore citrus and so will definitely be giving this little marinade a try!! Have fingers and toes crossed that the doctor gives you a “go” on putting weight on that ankle!! Lora – Yes, he’s the best! I don’t know how I would have managed through this injury without him. I love using citrus in marinades for both beef and chicken and I have ribeye in the fridge and citrus on the counter so yes ma’am, I’m doing it! By the way; I used grapefruit on a flank steak once because it’s all I had. I mixed it with ginger and it was fabulous but I have to tell you…that grapefruit packs a powerful punch; I’m glad we were cooking it that evening, I think if I had left it overnight I might have discovered beef shreds! That’s my only caution with this recipe, Barb. Don’t leave it in the marinade too long or you’ll turn your beautiful ribeye to mush. That citrus really breaks down protein! And do be sure to simmer the marinade and drizzle it over the finished steak. Or use another approach and pour all the hot marinade over the finished steaks and let them re-marinate for a few minutes before serving. Delicious either way!